I just stumbled across this and thought it would be interesting. If you take their survey, which only takes a few minutes, they give you a 10% off coupon for their web store and if you give them your e-mail address you are entered to win some cool stuff! I did it and if you have a few minutes I think you should too! Here is what they posted on their website about it. After last year's resounding success with the Great Wargaming Survey 2014, we decided to provide a follow-up. After all, some questions can only be answered by running a survey over and over (such as "is the hobby greying" - a snapshot can answer it it's grey, but it'll require several to determine whether there's a trend). 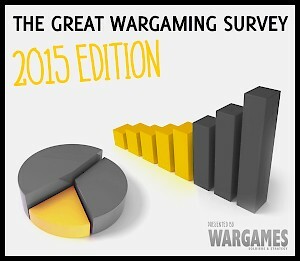 So we've tightened up some questions, added a few new ones in, removed a few (that might return in a year or two) and we proudly present the Great Wargaming Survey 2015. Like last year, it should be doable in 5-10 minutes and, as before, if you leave your email address you'll have a chance to win some very nice prizes. And again, there's a 10% discount coupon for everyone who completes the survey. If you're interested you can click here to take the test.